What Is Heart Rate Variability and How Do You Measure It? With the techification of fitness in full swing, fitness enthusiasts are starting to look like amateur Bionic Women and Six Million Dollar Men; a dozen beepy gizmos monitoring their every step, breath, and heartbeat like so many electronic Oscar Goldmans. Case in point: the recent onslaught of tech devices that measure heart rate variability — or HRV. Is this a useful metric? Do the über-convenient devices that measure it do so accurately? And can this new data point help you reach your fitness goals faster? What is Heart Rate Variability? Most are familiar with heart rate; it’s the frequency, in beats per minute, with which your heart pumps oxygenated blood. If you’re an old-fashioned type, you measure it by putting a couple of fingers on your wrist or neck and counting beats while you watch the clock. Techier types can do the same with a heart-rate monitor. In general, fitter people have lower heart rates. A stronger heart pumps more blood throughout the body with each beat, therefore it doesn’t have to pump as often. Heart rate variability is a little different. “It’s the fluctuation in time between heartbeats,” says Openfit Senior Fitness and Nutrition Content Trevor Thieme, C.S.C.S. Hairsplitting? To the contrary, these subtle changes, measured in milliseconds, are a powerful variable in measuring health, stress, and training readiness. Science types have long known that the heart is a lousy timekeeper. It’s constantly slowing down and speeding up based on your body’s moment-to-moment needs. Get out of your chair or lie down for a nap, and your heart rate adjusts accordingly. Even at rest, it varies significantly in response to subtle physiological demands like respiration, digestion, and even stressful thoughts. Central command for these changes is your autonomic nervous system. This subconscious subsidiary of the larger nervous system itself consists of two branches — the sympathetic (“fight or flight”) and the parasympathetic (“rest and digest”) systems, which, respectively, rev you up and slow you down. Going for a max deadlift, a big race, or an important meeting at work? The sympathetic nervous system accelerates your heart rate and frees up energy for muscular contraction. Taking a stroll in nature, hanging with loved ones, or settling down for a good night’s sleep? The parasympathetic system slows your heart and settles your nerves. When it’s healthy, your nervous system acts like a well-tuned race car, speeding up and slowing down with equal efficiency. When it’s overly stressed, it gets stuck, usually on the sympathetic side, and is unable to toggle effectively from one function to the other. A high HRV (greater variation in time between heartbeats) suggests your nervous system is responsive and supple. A lower one means it’s less so. What does heart rate variability reveal about your health? Like aerobic fitness, heart rate variability is trainable — the fitter you are, the higher it is. But it’s also highly responsive to day-to-day influences like sleep, diet, stress, exercise, injury, and alcohol intake. That makes it an excellent way to track day-to-day readiness for exercise. As a result, “it summarizes your recovery state,” says exercise physiologist Dr. Mike T. Nelson. That can be hugely beneficial for optimizing your training, as recovery status is often difficult to gauge, especially for new exercisers. “Most people are chronically sleep-deprived and stressed,” he continues. When you monitor HRV, you get an objective measure of the damage you do when you don’t take care of yourself — and of the benefit you reap when you do. If you go on vacation and your HRV increases significantly, you may be chronically sleep-deprived. If your HRV stays low for days after you take a particular spinning class, you might want to sign up for an easier session — or at least go less often. Once upon a time, the only way to measure HRV was by wearing cumbersome, specialized equipment for many hours at a time. But in recent years, several wearable devices have become widely available, many of them smartphone-enabled, including the Apple Watch, HRV4Training, ithlete, and the Oura Ring. 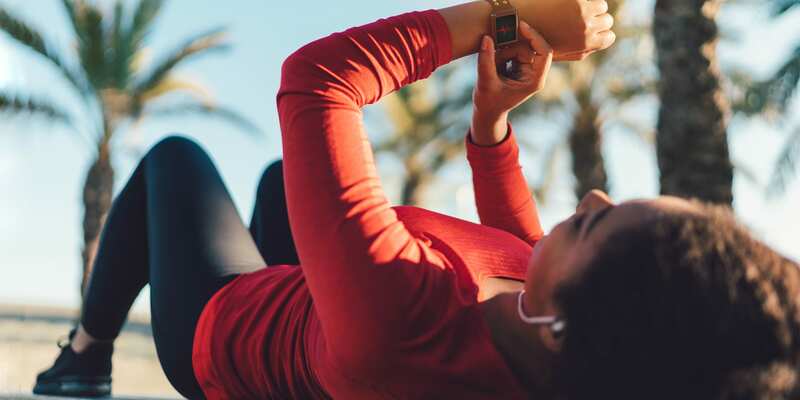 On all such systems, you’ll measure your heart rate at rest for a set time period (1-2 minutes for some apps; several hours for others), using either your smartphone’s built-in camera or an external device like a chest strap or a fingertip sensor. Following a measurement, the app may prompt you to answer a few questions about motivation, sleep, the previous day’s training, alcohol consumption, and other metrics, after which you’ll get a score — on a 1-100 scale or green-to-red spectrum — indicating your readiness for training. For maximum accuracy, measure heart rate variability first thing in the morning — when factors like caffeine consumption, work stress, and exercise won’t influence the reading — and do so consistently, at least five to six times per week for at least a month. You want to have a data pool to draw from so you can track long-term trends and have context for current readings. What Is a Healthy Heart Rate Variability Score? Heart rate variability data on healthy people is scarce. And since each app uses a unique scale, it’s hard to compare the numbers across different programs. So “good” and “bad” HRV scores in the general population have yet to be firmly established. Like your weight or body-fat percentage, however, it’s more valuable to ask whether your HRV is trending upward or downward. If it’s close to your average range, proceed as planned. If it’s low (Nelson says to look for any reading that’s 10 percent off your average score), reduce your training volume and intensity. Much lower than that? “Skip training that day and go to bed an hour earlier,” Nelson advises. If you’re so competitive that you can’t help comparing, click the “population comparison” tab on your app (if available), which shows your heart rate variability in comparison to that of other users of the same app. Want to bump up your HRV? The following strategies may help. Hang blackout curtains, or wear a sleep mask. Banish electronics from your sleep space. Limit screen time after 7 p.m.
Bad sleep doesn’t just decimate HRV scores — it also compromises athletic performance and stymies attempts to lose fat. Heart rate variability increases along with aerobic fitness, says Nelson. Cardiovascular training — especially the longer, slower kind — can improve the health of your parasympathetic system, which boosts HRV. The more cardio you do (up to five sessions per week, each 30 to 60 minutes in length) the more it will trend upwards (making allowances for the inevitable dips and bumps that occur as a result of the occasional long night or stressful day). If you don’t have a stress-reduction practice in place (regular yoga, stretching, deep breathing, meditation), and you don’t make an effort to spend relaxing quality time with family and friends, your hopes of achieving a beneficial HRV are dim. More and more people are up for the “suffering” part of exercise — lifting heavy, going hard at the cycling class, working up a serious sweat in a high-intensity workout. These same people need to be equally disciplined about resting, relaxing, and connecting. Can’t rearrange your life around a number in an app? Fair enough: we all have bills to pay and families to support. The solution: workout flexibility. When your HRV is in the gutter (after a late night of work or socializing), be smart: walk your dog, do some mobility work, and come back stronger after a good night’s sleep. When your HRV is high, take advantage of the situation: do a few extra sets or add a little weight to the bar. “For most people, lifestyle is less malleable than training,” says Nelson. But when you adjust training based on HRV, you wind up training and resting both harder and smarter. +Results vary depending on starting point and effort. Exercise and proper diet are necessary to achieve and maintain weight loss and muscle definition. The testimonials featured may have used more than one product or extended the program to achieve their maximum results. As an Amazon Associate, we may earn from qualifying purchases. © 2019 Openfit, LLC. All rights reserved. Openfit, LLC is the owner of the Openfit trademark, and all related designs, trademarks, copyrights, and other intellectual property. All other trademarks are the property of their respective owners.